I've been reading through early articles regarding David and Robin's murders and will be posting information here. 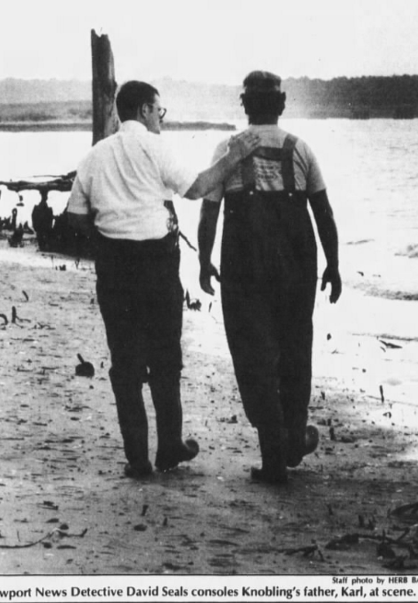 I hadn't realised that Karl was the person who had found David's body on the beach. What would be a heartbreaking moment in any circumstance for a parent must have been made immeasurably worse when considering the effect on David of having been in the water for three days. I cannot imagine the impact of that on Karl and what that must have cost him over the years. The bodies were found at ~1600 hrs but the police failed (didn't think?) 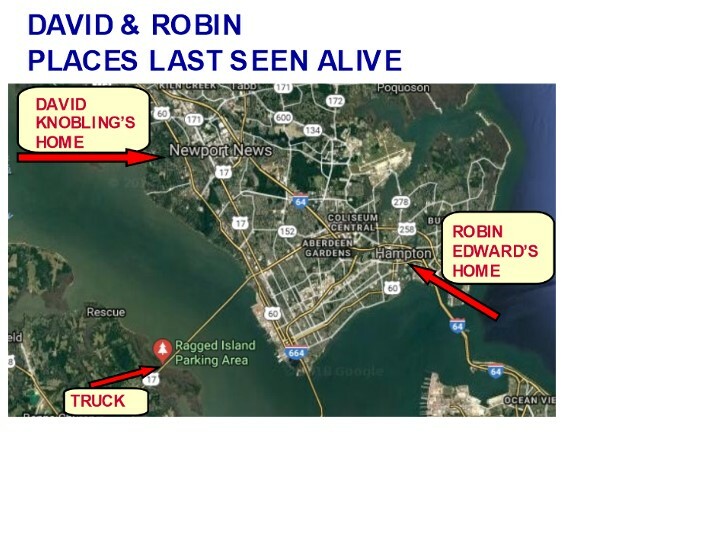 to send someone to the Edwards home to notify the family of the discovery. Mrs Edwards learned that her daughter had been found, murdered by a shot to the head, when she turned on her television at 1800 hrs to watch the local news. Perhaps this is an unfair comment but it seems like the local police lacked the experience and basic organisational skills to manage murder investigations. Too much time has gone by and I believe this case is solvable, with or without DNA. This madman known now only as the Colonial Parkway Killer must be apprehended! Cleo - ditto. I'm not sure if Mr Knobling is still alive but, if yes, he's had to live with the memory of discovering David for over 30 years now. The absence of any convictions, any answers just adds insult to injury. Agree 100% with you re the potential to solve these cases. But, aside from the possibilities the DNA raises, I'm less confident about the FBI's ability to solve the CPMs under its own steam (but very happy to be proved wrong). Back in the 1980s one of the parents (Mrs Edwards I think) said something like 'the problem with the FBI is it sits and waits for information to come to it, the FBI isn't out there looking for information'. We need as many people as we can get to BELIEVE he will be caught. As I said about the EARONS just a few weeks before his capture, sometimes you just have to will it. When I joined this board I was trying to find out everything I possibly could about the EARONS. I guess you could say I was arming myself with information. Mainly what the surviving victims said about the EARONS. I set out looking for him but he found me first. I just didn't realize it was him at that time. My point is their narcissism is often their downfall. They want to show everyone that they are smarter. I speculate he was thinking 'you think you are smart don't you Trabuco?' 'Your new thread, 'Was EAR a Cop?' This is when he began to send me pm's. He approached me. He wanted to know what I was all about and at the same time attempt to deceive and mislead with half truths. I never did talk to one of the victims but what I knew was they spoke the Truth and he didn't want anyone listening to them. I listened to them by reading what they told the investigators. In one of the Zodiac killer psychological profiles it said he surrounds himself with only those who will benefit him. If he can not get something from you or out of you then he has no use for you. Don't get discouraged. Keep digging for information. Remember the victims. Think about them. Keep their memory alive. Talk to others about them. Tell everyone you know. It's like, You see World? These are his victims. He took their lives. 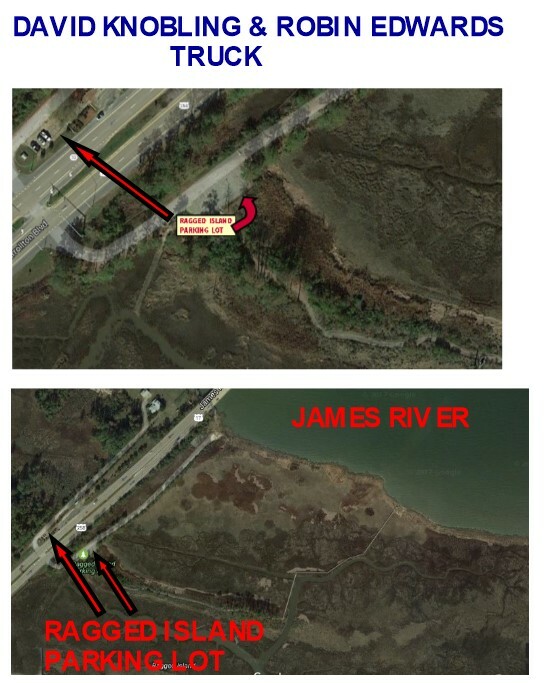 His name is the CPK (Colonial Parkway Killer) and this is what he has done. No more silence. Sorry if off topic but I felt led to share this with everyone. Thanks Trabuco; not off topic at all. And we need you here - making your observations about the cases, and asking the questions we haven't thought of so far. God willing, I will be here. The family members of the murdered victims are just as much the CPK's victims as their murdered relatives were. His time is almost up! Wasn't that what was always said about LE in the EAR case? Currently I'm still immersed in the 1980s reports and keep noticing how it all feels like it did when I was researching EAR. Of course, that may prove to be a good omen given LE's old mistakes in that case didn't ultimately get in the way of an arrest. My hope is that the similarities do not extend to making the CP families wait 40 years for an arrest. David's parents Karl Knobling and Judy Knobling are very much alive. I spoke with Judy Knobling a few days ago. Yes, I think it was, LOL. I read the mothers interview and it was horrible what she said happened. She didnt even know her son's body turned up. She was watching the news and they said two bodies washed up on the beach, then it showed David's half naked body lying there with tree twines all around him and she just screamed.